So, you accidentally tapped on your iPhone and deleted several precious snaps? Apple iPhone makes it easy to take awesome pictures, but these pics can also be trashed with a simple tap? When you realize those great shots you've taken with friends or families are gone, panic often sets in. Fortunately it's possible to retrieve those erased pictures and videos from an iPhone, through a "Recently Deleted" feature, or iTunes and iCloud backup, or a third-party iPhone recovery software. These are the four methods we're going to show you in this article. Note: Method #2 and #4 work with any iPhones including iPhone 4, 5, 5S, 6, 6+, 6S, and 7. The first method requires your iPhone to be with iOS 8 or later, and the iCloud recovery feature wasn't added until the iPhone 3GS and iOS 5 but will work with all the latest models. Apple noticed the accidental deletion issue and thus added a "fail safe" feature for recovering accidentally deleted media files. 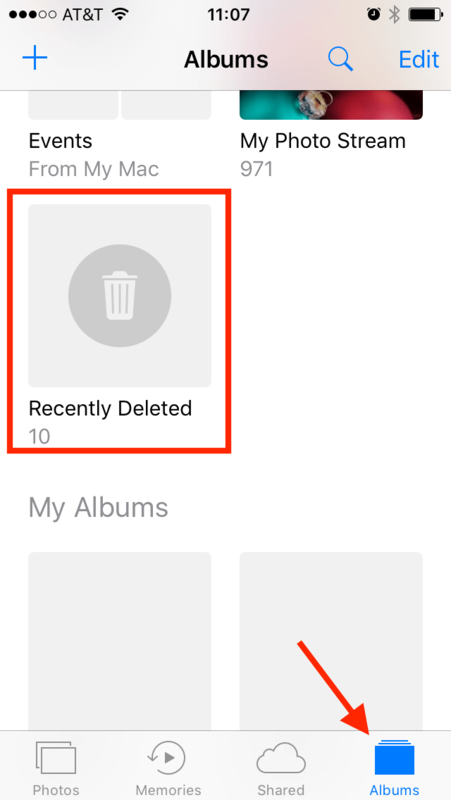 This built-in is called "Recently Deleted" - it's available for iPhones with iOS 8 or later, and works to restore items deleted within 30 days. To check what iOS version your iPhone is under, go to Settings > General > About to find out. Step 1. Tap Photos from the home screen. Step 2. Then tap Albums tab at the bottom. Step 3. Find the folder with a trash icon called "Recently Deleted." Step 4: Tap the photo(s) that you want back and click "Recover." That's it. Very simple, right? Once again, this built-in iPhone media recovery feature won't work for every scenario, especially if your pics and vids have passed the "30-day" grace period. If this didn't work out for you, try other methods below. If you often plug your iPhone into your computer to use iTunes, you may have a backup right inside iTunes. This method only works if you've actually created a backup before you lost those photos, but will work even if you dropped your iPhone into water and lost everything (or an equivalent disaster). If your iPhone was beyond repair, you'll want to follow these steps with a replacement iPhone. Here's how. Step 1. Plug your iPhone into your computer (the same one that you created the back-up on). Step 2. Open iTunes. If there's a pop-up telling you there's a new version, update iTunes before trying the backup. Step 3. Head to File > Devices > Restore from Backups. (Windows users that don't see a file menu, access it with the Alt key). Step 4. In the backup window, look at the list of available backups. Most likely, the most recent backup is the one that you want. But if you are looking to recover photos that you accidentally deleted a while back, you may want to choose the backup just after the date those photos were taken. (If you're going a while back, it may be a good idea to make a backup first, so you can save those photos to your computer, then return your iPhone to the current state so you don't lose even more files). Step 5. Click on restore. The process will take several minutes and will restart your phone — don't interrupt the process or unplug the phone until the update is complete. Find your photos on your restored iPhone? Great — if not, try the next two options. The iCloud is a convenient, often used way to backup your images. Since the iCloud backups are automatic, more users are likely to use the feature — which means there's a better chance of getting those photos back. The downside is that iCloud usually only works for your 1,000 most recent photos, not those older gems. There's actually two ways to recover photos from iCloud. Step 1. If you lost data because your iPhone was destroyed and you're starting from scratch, this is the method for you. When you turn on the new iPhone, you'll see the Hello screen. Follow the on-screen instructions, making sure to join a wi-fi network. Step 2. On the Set Up Device screen, tap on Restore From an iCloud backup. Choose a backup based on the date—ideally the most recent one, unless you are looking to recover old photos. Tap it to start. Step 3. Stay connected to wi-fi until the process completes — big backups will take some time. When prompted, put in your Apple ID and password that you used with the iCloud backup. Don't need to restart your phone? You can access iCloud images in iPhoto or the newer Photo app on a computer. With iPhoto: Open iPhoto, then access the iPhoto menu at the top left and click Preferences. Click on the iCloud tab, then put a checkmark next to My Photo Stream. Then, close the preferences window and click on iCloud on the left hand side of iPhoto — you should see your iCloud images there. With Photos: Open the Photos app, then click the Photos menu on the upper left and select preferences. Then, navigate to the iCloud tab. Put a checkmark in the iCloud Photo Library option. Close the preferences window, and your photos will automatically load, provided you use the same Apple ID on both the computer and iPhone. While the iCloud may have limited storage space, it's automatic, so once you've set it up once, you don't have to worry about plugging into a computer to backup your phone — that makes it much more likely you'll be able to recover deleted photos from your iPhone. Didn't make a backup? You may still be able to recover your deleted photos using a recovery software. While using software is a pricier solution, sometimes it's hard to put a price on those lost photos. Most programs will also allow you to download a free trial so you can at least see if the recovery will work before purchasing a program. Dr. Fone is a popular option because it's simple and often works well. The initial download is free, a purchase is only necessary if the software can detect files to recover. Be aware though that some users have reported that they couldn't uninstall the software. MobiSaver is a great iPhone recovery software that's also simple to use. Along with recovering your photos, you can use it to find lost contacts, messages notes and more. While the free version has a limit to the number of photos it will recover, it's often worth a shot. Losing photos and videos is devastating — often even more so than damaging an expensive phone. While you can't replace your photos as easily as your iPhone, you can recover deleted photos and videos from an iPhone by using the recently deleted feature, an iTunes backup, an iCloud backup or third party software.